With the peak of summer in the rearview mirror, our daily length of daylight is beginning to decrease and our normal high temperatures are starting their downward trend toward fall and, dare I say, winter. Football and soccer have taken center stage on many fields. In the meantime, many sports turf managers are beginning to plan their fall renovations. If you are managing fall football and soccer fields, you are planning your strategy to keep grass on your fields as thick as possible for as deep into the fall season as possible. This is a challenging job, especially for northern turf managers as winter begins to creep in towards the latter part of the season. 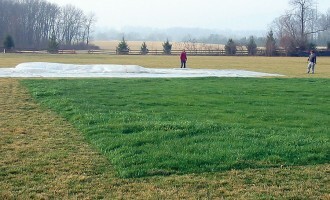 But there is an excellent tool for extending the growing season on your turf… Turf Blankets! Turf growth blankets are semi-transparent, loosely woven fabrics that allow sunlight, oxygen and water to enter the covered area while protecting the turf from cooler or colder weather as if it was in a greenhouse. The blankets come in a variety of sizes in order to concentrate on just wear or problem areas, or you can cover an entire field. In the fall they can extend the seeding season by several weeks in the north. The blanket holds in heat and humidity thereby keeping soil temps up and humidity levels optimum for more rapid germination, even as days grow colder in the late fall. This is especially helpful for football and soccer fields that commonly see wear areas develop as the season is winding down. Some will cover their entire fields over the winter to protect the turf from winter desiccation. When doing so, preventative applications for snow mold (if you are usually susceptible to this threat) and use of a plant growth regulator (PGR) will keep the turf healthy and under control from a vertical growth stand point. Others will use their turf blankets to help turf green up more quickly early in the season by deploying them in late winter/early spring. The greenhouse effect helps to raise the soil temps more quickly bringing the turf out of its winter dormancy weeks earlier. In this situation, again, you should consider preventative treatments for snow mold if you are susceptible to it. When you have determined that it is time to remove the blankets from the turf, you will need to “harden” the turf off first. The turf is usually very lush and tender after an elongated period under the blanket in its “greenhouse” making it very susceptible to injury. 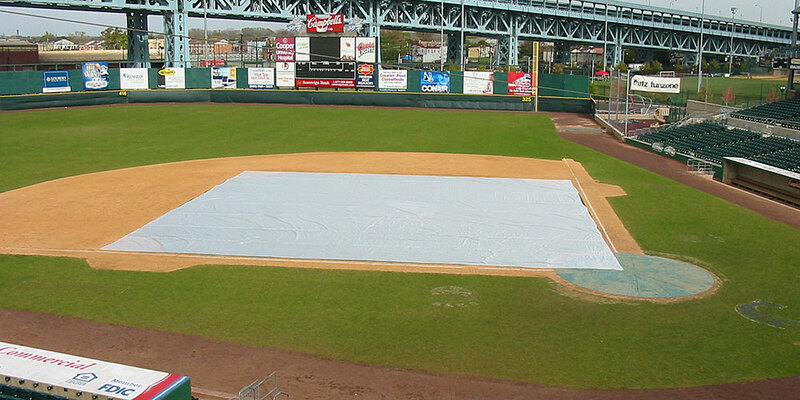 Harden off your turf area over the course of 7 to 10 days before finally removing the blankets for good. This is accomplished by removing the blanket during the daylight hours before returning it under the cover of the blanket for the overnight hours. Make turf blankets a part of your annual field recuperation/renovation program to help reinvigorate and thicken your turf stand for the next season.